The trustee's deed is a statutory conveyance under Section 47-36c of the Connecticut Statutes. Unlike other forms of conveyance, it is named for the person executing the deed rather than the type of deed it is. Used in trust administration, the trustee's deed conveys real property out of a trust. 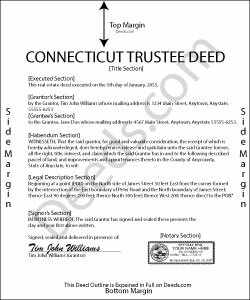 Since trusts cannot legally hold title to property in Connecticut, the trustee holds title to real property as a representative of the trust. The trustee must be authorized by the trust instrument to hold the position of trustee and to act on the trust's behalf. A basic trustee's deed will name the trust's original trustee as the grantor and vest title in the name of a grantee. Sometimes, the grantor appears as a successor trustee if the original trustee is unavailable, due to death, for example. Documentation evidencing the change in trustee must be recorded in the town's land records. When correctly executed, the trustee's deed grants title in fee simple to the grantee with the following trustee's covenants, pursuant to Sec. 47-36s of the Statutes: (1) the trustee is duly qualified to act as trustee, (2) the trustee has full power and authority as trustee to bargain and sell the described premises in manner and form as set forth, and (3) the trustee and the trustee's successors shall warrant and defend the granted premises against all claims and demands of any person claiming by, from or under the trustee. Sometimes, a third party may request a declaration or certification of trust as proof of trustee's authority to transfer title. As with all documents affecting real property, the trustee's deed should contain a legal description of the subject parcel. All trustees must sign the deed in the presence of a notary for a valid transfer. Two witness signatures are required (Conn. Gen. Stat. 47-5(a)(4)). In Connecticut, land records are recorded in the individual town where the property is located, and not at the county level. Daniel S. said: It was easy to find the forms I was looking for and the guided steps and examples of how to use the form were beneficial.